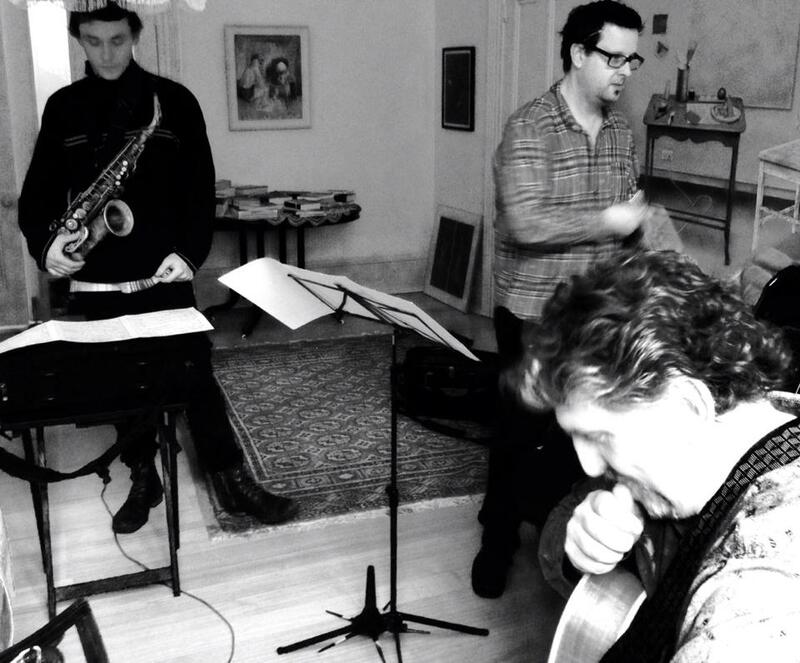 Here’s a picture of rehearsals taken by Allan… that’s Scott McConnachie on the left. Looking forward to hearing what he brings on deck. Read literally, Rimbaud’s poem “Le Bateau Ivre” (The Drunken Boat) is the story of a boat’s journey and the emotions that accompany it. Read symbolically, the poem is a different kind of journey; a wild and complex work. Like all art, the poem creates a space of its own and it is from within that space that it has inspired other artists of all kinds, including (lucky for us) Allan Browne and via him, the Allan Browne Quintet. The end result is a CD – The Drunken Boat on the Jazzhead label – that creates its own space. More than a CD, The Drunken Boat is a project. And like Browne’s Five Bells project CD released in 2006 (also through Jazzhead), this project is about music that launches off a text with which Browne (a poet himself and a lover of good poetry) has found some resonance. Last year, on ABC Radio National’s program The Weekend Planet, Doug Spencer said of Five Bells and Other Inspirations that it “is primarily a particularly sensitive set of responses by Allan Browne’s Australian Jazz Band to particular poems by Slessor.” Replace the name of the band and the poet, and something similar could also be said of this most recent recording. Browne started by sharing the poem with the band, which includes Eugene Ball (trumpet), David Rex (sax), Geoff Hughes (guitar) and Nick Haywood (bass). There are a number of translations of the poem available and Browne did not play favourites, while also acknowledging that the Paul Schmidt version is most widely held to be ‘the one’. He’d first read the poem in a book of Samuel Beckett’s works so it was Beckett’s translation that triggered something for him in the first place. Hughes, who with Ball composed tracks on the CD, also says it was the Beckett translation that resonated the most. Both projects took about a year to complete, and they both focussed on the work of a particular poet. Yet there are also some notable differences. With The Drunken Boat Browne was aiming for something very cohesive. He wanted music from ‘now’ because he was working with the quintet – a very contemporary line-up that was at least partly inspired by what Browne experienced a few years ago at a John Scofield gig at The Continental in Melbourne. Browne was also quite clear that it didn’t matter whether people decided it wasn’t jazz. He “didn’t care because it was music”. So far, he says people have said they love the CD and as for the jazz question, well he just doesn’t want to get into the semantics of that. The composition process was certainly not straightforward and went through a number of iterations before ending up as the one-tune-per-stanza that is the final result. He thought it would be interesting to have Ball and Hughes write it together. The band had a few sessions and talked about the poem and where they could go with it. Hughes says he had read about three versions of the poem when he began composing for it. Beckett’s translation triggered something that allowed him to ‘just start writing’. He, like Browne (and other members of the band) are fans of good poetry. The original concept had been to simply write music in response to the text and in composition, he allowed himself to be guided by the imagery and work with the associations that arose from that. The process, he says, struck him from the first as being “completely logical”. In the beginning, Hughes and Ball composed separately. They came together later in the process and manipulated the music they had written to fit the structure of the poem. The recording session was a 14 hour marathon. Hughes comments that even with their separate sensibilities and although the bulk of the initial writing was done without a great deal of contact, it was clear that both he and Ball had a shared response to the text. The music fitted together extremely well, even down to the keys in which individual pieces had been written. The result of the process is a CD with 25 short tracks that creates a world of its own yet resonates with the boat’s journey. The track titles give a description of the different places that the boat goes, providing almost a précis of the relevant stanza of the poem… also contributing to the sense of the journey. At one stage, Browne was wondering how a CD with 25 tracks on it was likely to be received. He spoke to people like Mal Stanley (presenter of ABC Classic FM’s Jazztrack program) and others and the response was positive. It could have ended up as 90 minutes of music but from the beginning the group wanted the CD to be able to be played in one sitting and the short tracks allow that to happen. The Drunken Boat runs to about 57 minutes in total. And what about the music? I suggest you try it yourself. Let the intersection between Rimbaud and the Allan Browne Quintet intersect with your own inner space. My own experience of it was completely satisfying: I heard the whole CD in my headset, walking home from the city, through inner city grunge, then dodging shoppers in a street filled with Vietnamese markets and finally across the Yarra and up the hill to leafy Kew. I can recommend the journey.